Peaches are known to have originated from China and later on, found their way to other parts of the world. Peaches are a great source of carbohydrates, protein, dietary fiber, vitamin C and vitamin A. It has been highly recommended to fight cancer. Having peach in your daily diet fights deadly diseases like cancer. It has good amount of boron which encourages the estrogen level in postmenopausal women, which is great boon for women. It also stimulates your brain and prevents the chances of osteoporosis. It is also known to lower your blood pressure. It is low on calories which make a huge difference to people who want to maintain their weight. Peaches are very useful for digestion due to its alkaline content so you can say goodbye to all our stomach problems. It is a good source of dietary fiber which works superbly for constipation problems. It helps to prevent hemorrhoids which can give lot of trouble. It helps to recharge your immune system which can prevent many diseases including shingles. If you have trouble with your heart, this fruit helps to put a stop to the heart strokes. You can also avoid any constipation problem by having this fruit. It is rich in potassium, sodium and calcium which can provide a good complexion. With 88 per cent water content it is known to be thirst-quencher. It is a great way to clean your kidney and bladder due to its laxative properties. It can perk and energize you if you have good amount of peaches. 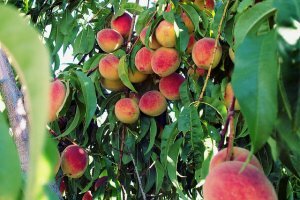 Can you believe there more than 200 varieties of peaches and more than 175 varieties of nectarines. It also contains good amount of carbohydrates which has the ever essential phytonutrients (plant-based nutrients), anti-oxidants and carotenoids. The presence of carotenoids means, it would be great for your eyes. Lutein and zeaxanthin filter present in peaches protects your eyes from scotching heat. It also protects your eyes from other disorders related to your age like macular degeneration and cataracts. The anti-oxidants and nectarines helps you fight diseases which are related to aging. Eating peach along with its skin before going to bed would help you to sort your constipation problems. Dried peaches are rich in iron and are very useful for anemia. If you are baking peaches, leave the skin on it to provide more benefits to you. Planning to be on a diet, have peaches. It being low on calorie makes a whole lot of difference in your diet.